When I decided to re-read Frankenstein to tie in with my university course, I remembered that I had bought the re-interpretation of it by Dean Koontz, largely on a whim; I figured that it might be useful, so I took it with me as a potential read. And, stuck waiting for my last university text to arrive in the post, I was stuck for something quick to read in the meantime. Hence why I have two Frankenstein related posts within a few days of each other. The obvious question is how does this version stack up against the original. Prodigal Son has several plot-lines. First you have the Creature, here named Deucalion, who travels to New Orleans after an old friend of his reveals that his creator, who has renamed himself Victor Helios, is still alive after 200 years. Second you have a murder mystery plot, in which Detectives Carson O'Connor and Michael Maddison try to track down a serial killer who is removing body parts from his victims. Third you have Victor Helios as he does all kinds of creepy things in the name of creating a utopia, as well as the reactions from the fourth version of his wife-creature. And finally, you have Randal Six, a creature created by Victor who was deliberately designed to have a severe form of autism, a condition that he believes he can remedy by meeting another severely autistic teenager, Arnie O'Connor. For the most part, these plot-lines are woven together with skill, and for the most part they do meet a temporary form of resolution by the end, but considering that this is the first part of a 5-book series, I'm not too worried about the loose plot threads. In terms of the review, I think it would be an idea to look at each in turn, as they tend to deal with one or two major characters each. So, Deucalion. I like him about as much as I liked the Creature in Mary Shelley's Frankenstein. I like the fact that he is at once very human and sympathetic, but at the same time holding back a lot of murderous rage that had gotten the better of him in the past, events covered in the original. 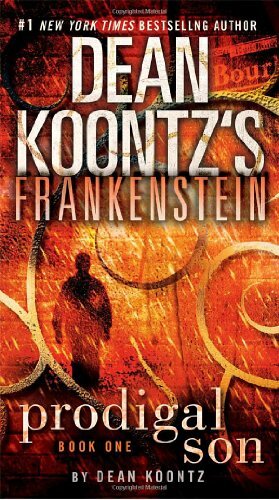 I also liked the history that Koontz creates for him in the interim between the events of Frankenstein and those of Prodigal Son, primarily the idea of him being part of a carnival freak show; something about that makes a really sick kind of sense and makes for interesting acquaintances. There is one major problem though: it almost felt like he was a cameo in his own story. He's introduced at the start, then doesn't really turn up again until Carson and Michael get in over their heads, making him feel a bit like a deus ex machina. I really hope that this is addressed in later books, but at the moment it's something that left me disappointed. The murder mystery plot is very well handled. At first the solution appears simple to the reader, but then there are certain revelations about the murders that complicate what the reader thinks he knows. The outcome makes sense and the ultimate show-down is well-paced if a little disappointing because of the aforementioned Deucalion-deus-ex-machina bit. The characters of Carson and Michael are well-written, if very familiar, characters. Carson is the serious, driven one with family to avenge and protect, while Michael is the wise-cracking sidekick who carries a torch for his partner; pretty standard stuff, so much so that I ended up hearing the main characters from Castle in my head when they spoke. Regardless, their chemistry was fun, despite the predictable nature of it. Now to the other re-interpreted character, Victor. Oh my lord, has Victor changed almost completely in this. The version of Victor that Prodigal Son uses is undoubtedly a villain, as opposed to the original's more misguided nature. There are good things and bad things about this monumental change. I'll start with the good. On the plus side, it does bring an additional horror element to the book, as Victor is by far the creepiest thing in it; after 200 years, he has become a sadistic monster obsessed with achieving perfection, whether it be at the dinner table or in his lab trying to create the perfect race with which to infiltrate, eliminate and replace humanity with. He has plenty of moments that are somewhat reminiscent of Hannibal Lecter, which is fun. Unfortunately, one thing that this version of Victor is not is subtle in any way shape or form. Firstly, Koontz seems to feel that he needs to include things to show just how evil he is; there are three main things that come to mind. One, he needs to beat the crap out of his wife in order to get aroused, which is why she is the only creature he makes that is designed with the capability of shame. Two, he is an atheist so aggressive that he considers decommissioning the current model of his wife because she appears to enjoy the poetry of Emily Dickenson. Three, he eats live baby rats; at that point in the book, I couldn't help but feel that Victor had crossed the line from creepy complete monster to cartoon villain. To be honest, I can see why Victor is irredeemably evil here, as it creates a long-term villain for the good guys to fight. The one thing that did irritate me about Victor was that he actually mentions Frankenstein in his internal monologue, because apparently this is supposed to be our version of the universe, and he insults Mary Shelley's characterisation; I know that this is a villain's point of view, but it rubbed me up the wrong way a little as it seemed a bit disrespectful towards the source material. Perhaps I'm looking into it too much, but oh well. The only other character of note from Victor's storyline is Erika, the creature made to be Victor's wife. She was sweet and likeable, but ultimately it felt like she was just there to show how evil Victor was through his treatment of her. Finally there's Randal Six. He's an autistic creature who Victor is experimenting on to figure out how to cure autism. He's confined to his room not by locks, but by the intense agoraphobia brought on by all the information that he is bombarded with by the world outside; his only means of calming himself down is by filling in crossword puzzles. I found these chapters to be very uncomfortable, simply because of the severity of his symptoms. It's odd, but part of me can't help but feel that Randal's mindset is probably the most alien out of all the various viewpoint characters that are showcased; while Victor is creepy and undeniably evil, I can understand why he thinks the way he does. I can understand Deucalion's mindset despite his widely different experiences. The best I can do for Randal's character is pity him, because I honestly have no concept of a mindset that non-neurotypical and I don't think I ever will. It leaves me confused as to what to think of Randal at the end of the book as he is both pitiable and a very real threat. It feels strange that Koontz should have Victor, a villain as subtle as a brick to the face, juxtaposed with a character as ambiguous as Randal Six. Much as I would like to see how this character develops further though, I must admit that as a work by itself, Randal's chapters in Prodigal Son feel by far the most superfluous. I hope he gets more plot significance later on though.